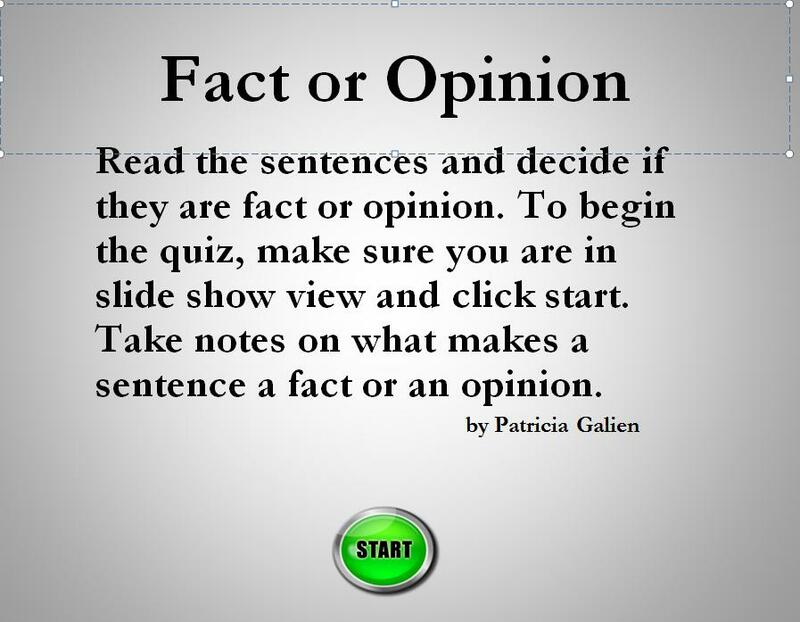 In an earlier post on Interactive, Non-linear PowerPoint Presentations I mentioned that my beginning writing students have difficulty differentiating between fact and opinion and that I made an activity to work on this (Fact or Opinion). In her comment on that posting, Wendy expressed an interest in finding out more about how I use this exercise. Her comment was: “I’m interested to know exactly how you present this exercise in class. How do you structure this exercise into the lesson? Does each student have his/her own laptop to work from? What exercises do you do to follow up? or what comes next once the students finish the exercise.” I thought I would use this post to follow up. Basically I’ve tried two different ways to use this activity. The first time, I assigned it as homework. I linked it to my Blackboard site and then students did it at home or at the library and returned to class with two lists: one of things that makes something a fact and the other of things that makes something an opinion. I collected the lists at the beginning of class and then we had a whole class discussion. As we talked, I put the students’ ideas in two lists on the board. Later, when we talked about how an opinion paragraph is organized, I referred back to this exercise and reminded students that their main idea should be an opinion and, as much as possible, their supporting points should be facts. Before I used it the second time, I built in more support for the students. Towards the beginning of the activity I added more feedback on the reasons something is a fact or an opinion. This time we did it as a teacher fronted activity using the podium (a computer, projector, and a screen at the front of the classroom). I asked the students to sit in pairs. Each time I put a new slide up, the students conferred with their partners. The pairs needed to supply an answer (fact or opinion) and a reason for their answer as well as take notes in two categories, fact and opinion. I went through the first several slides slowly, but picked up the pace as students became clearer about the differences between fact and opinion. In the end (as above), we talked and I put their lists on the board. I contextualized the lesson in the same way as above. My feeling is that more students benefited from the exercise when I used it the second way. For one thing, when the exercise was homework, not everyone did it. Also, the lower level students did not have the support that they got when we did it in class. I also think it was beneficial for students to talk with someone else about the reasons something was a fact or an opinion. (We also enjoyed a few laughs together in class when we made a wrong choice and heard “oh no!”) If you don’t have a podium in your classroom, the first way is the only way. Also, the first way doesn’t use up as much class time. It will be interesting to try this activity in more ways. I could see it working well in a computer lab, but I think I would still ask the students to work in pairs with two students sharing a computer. This way everyone stays on track; they all get a chance to think and verbalize their ideas; and the students who need more support can get it from their partners. I also think this activity would work well in an online course. Students could use the discussion board or a wiki to confer with a partner and together they could produce a list in two categories. It would also be interesting to see if the class is able to contextualize the activity. Upon finishing, I could simply ask them how this relates to writing an opinion paragraph. I use PowerPoint a lot in my classes. All of my students are second language learners, and some of them have more difficulty picking up meaning from the spoken word than others. Because of this, I like to put key words on the screen in the classroom when I talk. Until last year, this was the only way that I used PowerPoint, but recently I learned how to make non-linear, interactive presentations, and they can be pretty cool! With PowerPoint you can make activities, games, and quizzes that are teacher fronted or student driven. The class can work together on an activity, or it can be self-paced. If you use Blackboard or have a website, students can also use these presentations to study at home. One unit in my beginning writing class is on writing paragraphs of opinion. One difficulty that my students have is differentiating between fact and opinion. To work on this point, I made a non-linear PowerPoint presentation that combines comprehension checks and teaching. As the students work through the material, they take notes on what makes a statement a fact and what makes a statement an opinion. To see this activity, go to Fact or Opinion. To learn how to make this type of presentation, follow the link to the the presentation I recently made for a workshop that I facilitated: Interactive, Non-linear PowerPoint Presentations. Have fun!